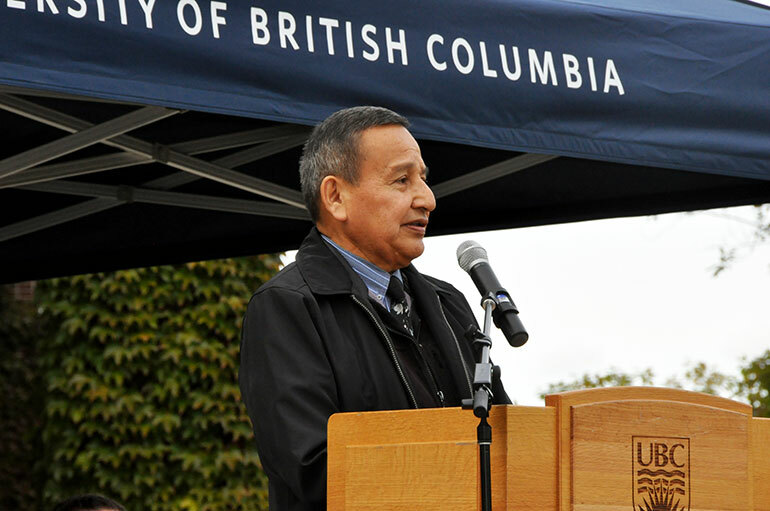 Grand Chief Stewart Phillip, ONA Chair, called the flag raising at UBC’s Okanagan campus an honourable and historic day. A new and permanent place has been given to the Syilx Okanagan Nation flag at UBC’s Okanagan campus. Yesterday members from the Syilx Okanagan Nation and the UBC Okanagan community gathered at the university’s courtyard to celebrate the raising of the Okanagan Nation flag on a newly installed pole. The Okanagan campus is located on the ancestral and unceded territory of the Syilx Okanagan Nation. The flag raising formally signifies UBC’s recognition of the Syilx Okanagan Nation in whose lands the university resides. UBC Deputy Vice-Chancellor and Principal Deborah Buszard says creating a home for the flag on this campus has been on her mind for some time. 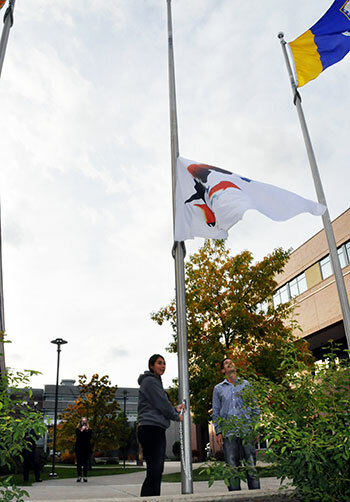 This spring, the university and the Okanagan Nation Alliance (ONA) began plans to install a fourth flagpole, giving the Syilx Okanagan Nation flag a place to fly continuously alongside the UBC, Province of BC and Canadian flags. UBC students Briana Wilson and Cody Isaac raise the Syilx Okanagan Nation flag during a special ceremony at UBC’s Okanagan campus. At yesterday’s event, a number of dignitaries spoke about the partnership with UBC and the ONA including UBC Chancellor Lindsay Gordon, Westbank First Nation Councillor Chris Derickson and Okanagan Indian Band Councillor Dan Wilson. Amber Cardenas along with Margaret Manuel sang the Okanagan song whilst the flag was raised by Syilx Okanagan students Briana Wilson and Cody Isaac. Speaking at the event, Grand Chief Stewart Phillip, ONA Chair, called it a special moment in BC’s history. A similar flag-raising event is planned for UBC's Vancouver campus later this year. Each campus sits on the traditional territory of its host nation: Musqueam in Vancouver and the Syilx Okanagan Nation in the Okanagan. The flags formally signify UBC’s recognition of Indigenous peoples in whose lands the university resides, explained Chancellor Lindsay Gordon, and will add to a growing visible Indigenous presence on both campuses that includes bilingual signs providing alternate street names in hən̓q̓əmin̓əm̓ and nsyilxcən Indigenous languages.